A light paint color can breathe new life into old wall paneling. Dark wood wall paneling sure had its heyday, and it surely is over! Wall paneling can be tricky to update, and whether you can resurface it by filling in the grooves depends on if your paneling is solid wood or plywood. Here are some tips and suggestions for how to update wall paneling in your home. If your paneling is solid wood made from individual, tongue-and-groove or V-groove boards, don’t try filling in the grooves, since it will tend to crack and fall out as the wood shrinks and expands with the seasons. The glossy finish on plywood paneling has to be sanded before finishing. You’d be surprised how far a nice, light paint color can go in updating the look of wall paneling. If your paneling flexes or gives when you push on it, painting is probably your only solution, since filling the grooves will tend to pop loose over time. Step #1. Sand Paneling: Most plywood paneling has a slick finish that prevents paint from adhering well. So before you start, sand the entire surface with medium (120 grit) sandpaper to remove the gloss. Step #2: Prime Paneling: Next, apply a high quality primer and allow it to dry. If there are any problems with the primer not sticking, resand and correct it now, because it’ll only get worse! Step #3: Paint Paneling: Finally, apply at least two coats of latex wall paint. The finished wall will still have grooves, but they will be much less noticeable, and the overall look will be dramatically improved. If the plywood paneling is rigid and doesn’t flex when you push on it, you may be able to fill in the grooves with drywall joint compound before painting to give a smooth surface. Step #1: Sand Paneling: Start by sanding the surface with medium (120 grit) sandpaper to remove the glossy finish. Step #2: Prime Paneling: Next, apply an even coat of primer to give a uniform surface for the filler to stick to. Step #3: Fill Grooves: After the primer dries, fill in the grooves in the paneling with standard drywall joint compound. Use a putty knife to apply a thin layer of joint compound in the cracks. 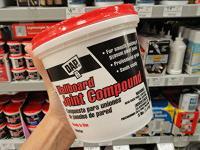 Don’t use spackling compound, which isn’t durable enough, or caulk, which won’t sand smooth. Step #4: Additional Coats: Allow the joint compound to dry and shrink overnight before applying each additional coat. Continue applying the compound in thin layers until the cracks are completely filled. Step #5: Sand Paneling: Once the joint compound has dried, sand the surface smooth with medium grit sandpaper. Step #6: Prime Paneling: Apply a coat of latex wall primer to keep the joint compound from showing through. Step #7: Paint Paneling: At long last you’re ready to roll two coats of high quality, latex wall paint on the paneling! Go Light with the Putty Knife! Resist the urge to slather on the joint compound to try to save time. Not only will it crack and look awful, but the wet putty will soak into your paneling, causing it to permanently swell and warp. If you’ve come to the conclusion that all that filling and sanding is a lot of work, you may want to skip redoing the paneling in favor of a permanent fix. If the moldings and trim are installed over the paneling, as is usually the case, start by removing them. Use a hammer and flat pry bar to take off any quarter round, baseboards, crown molding, chair rail, or door and window casings. Mark where each molding came from on the back, and save them for reuse later. Option #1: Rehab Old Wall: If the wall has plaster or drywall behind the paneling and the paneling wasn’t glued to the wall surface, you may be able to remove the paneling and rehab the old wall surface using drywall joint compound. 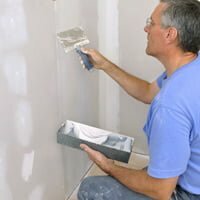 Before filling nail holes in drywall with joint compound, dent the surface around the nail hole slightly using a hammer with a rounded head or a special drywall hammer, so the joint compound will adhere and sand smooth. Removing the paneling will cause some of the moldings to be a bit short, so you’ll need to either add to the existing moldings or replace them. Option #2: Cover Over Paneling: Alternatively, you can install a layer of 1/4” drywall directly over the paneling, making sure to nail or screw the drywall into the wall studs. Next, tape and fill the seams and nail or screw heads as you would any drywall job. This may sound difficult, but compared to filling and sanding several hundred paneling grooves, a few drywall seams don’t seem so labor intensive! Covering the paneling will cause the wall to be thicker, so some of the moldings will to need to be trimmed, and the casings around doors and windows may need shimming to cover any gaps. We have bought a 1970’s home. Kitchen and dining room are wallboard or some kind of paneling, when you hang something the wall is not solid so assume it is paneling that has been painted has grooves in it. Kitchen has been painted poorly with a dark red wine color, Surface has drips that were not sanded and were painted over, There was no basecoat looks terrible. Would like to tear it out but cannot do that at present time. All suggestions appreciated. Ready to get it done. THANKYOU Clarissa for mentioning TSP!!! I used to use it all the time instead of sanding and you are the ONLY person to mention using it. Hope others will listen , it is ALOT less messy and practical alternative. Kristi in Ca. Sanded primed filled and caulked panelling but the caulk keeps cracking between joints have removed and recaulked allowing 24 hours to dry but keeps cracking would I be better off using joint filler? It’s old panelling that has a plywood middle with moulding over top so it’s the joint between plywood and moulding that keeps cracking. Please help!! I am wanting to get some ideas on painting over paneling that is in a mobile home. 1/4 of the wall is wood paneling and the other is sheetrock. Will I need to prepare this to paint and if so, what do I need to do. 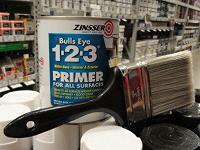 If you are planning to paint the wall paneling then remember proper preparation is important. Always begin with wiping the paneling using a clean damp rag to remove any dust or dirt. Then putty the nail holes and other imperfections with spackling compound. You can consider sand paneling followed by sand trim. Using caulk for the cracks and gaps, where the paneling meets the baseboard or around doors and windows is also recommended. Can you turn paneling over and paint on the back? Cimino, use the glaze (test first) that comes with the faux coating. Should work. 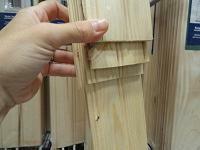 Get a small panel from your local Home improvement store for practice. The house we bought is about 40 years old. Will the solid pine paneling still bleed through painting after all these years? Not dry enough now? My husband and I have lived in Florida for 10 years. We are both from New England. I’m tired of all this “light paneling in my mobile home (as a matter of fact, EVERY HOME is the same in this park. I’d like to make it a little darker and still have the wood grain texture. How can I do this? I’m renting a room that has wood floors. Can I use outside porch paint to paint my bedroom floor? Its old wood floor that already been painted dark brown. How do I paint knotty, birch wood paneling. Do I follow the same direction for the imitation wood paneling? Same question as trena nov. 8, 2013. Got the wallpaper off and the backing of the wallpaper off. Now there are places on the panelled walls that have a mixture of tongue and groove fill, possible compound to smooth out the uneven areas in the walls, patchy areas of paneling showing and some kind of thicker paper possibly used to also smooth out areas of the walls or to help the wallpaper look smoother or stick better. After sanding in areas and applying TSP, can I just put thin coat of compound on the entire area, sand down for smoothness, prime and paint? I have experience with taping, using joint compound, spackling, texturing, priming and painting. Thanks for your time. I have mobile home that in bathroom put up dry wall ceiling. There are gaps around perimeter. Can I fill with joint compound? Walls are good quality paneling. I am moving into an older trailer, that was taken care of, but I want to cover the paneling with dry wall, my question is the weather is rainy, will there problem with moisture behind the drywall? I’m moving into an older home and the walls have wallpaper over paneling. You can see the wallpaper peeling up at the edges all over the house and it really looks nasty. I would like to fix it some how but not quite sure where to start. The wallpaper has a raised up design on it also. I paint for a living but this looks like a huge undertaking. Please help! Could u buy the paint and primer mixed? Would it work the same?